I am scared to death of change. Change makes me as nervous as a cat on a hot tin roof. In August of 1987, the month I left home for college, I think I slept a total of ten hours throughout the entire thirty days. I would sit up and pour over my admissions paperwork, and my mind would race over the same subjects. Did I turn in all of my documents? Did I have the right backpack? Will people like me? Will I have enough moisturizer? Finally, when I arrived on campus, it was like second nature. After being introduced to fraternity rush, I suddenly realized that I was okay, that people liked me, and that, no matter where I went in this world, I can never have enough moisturizer. Once, my unofficial therapist, the doorman at the Hustler Club, told me that in another life I was a pirate, and that is why I didn’t like change. Another unofficial therapist, the bouncer at the Penthouse Club, told me I hated change because my “inner me” wasn’t happy with my “outer me”, and that both my “ME’s” needed to sit down and have a chat. Well, after buying an eye patch and a parrot and never really understanding the “ME” thing, I got a real therapist… a therapist who wouldn’t offer advice while bouncing me out of the club for using my iPhone. My therapist, with a real degree, told me that change means something new is about to happen, and new experiences are how we grow and thrive as people and as a society. That is hard to argue this year, in a city marking its 300th birthday amidst celebrations of growth, change, and diversity in one of America’s most amazing places to live. No, I don’t mean Cleveland! 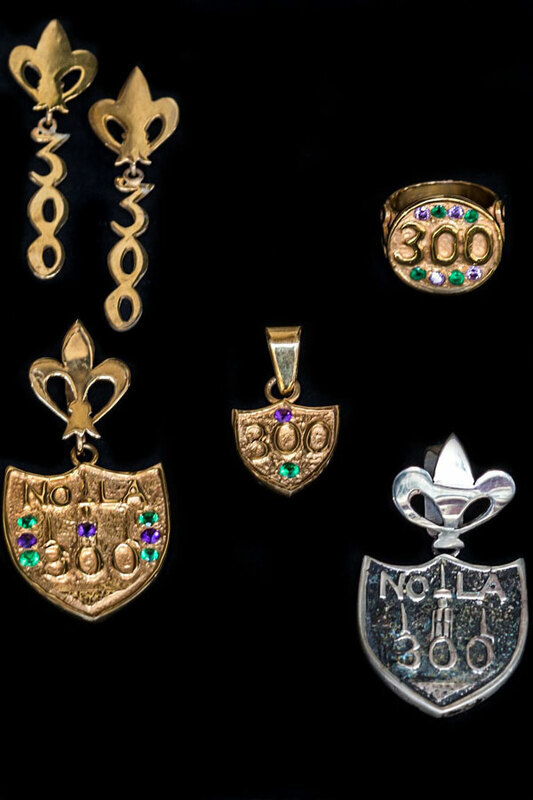 Gallery Arlo at 837 Chartres St. has welcomed new artist Claire Blue with her own personal celebration of New Orleans in the form of a jewelry line to celebrate its tricentennial. Blue moved her family from Texas to New Orleans to become permanent residents of the city that have given her and her family so much love. If that’s not change, I don’t know what is. She credits New Orleans with not only inspiring her as an artist but also as a mother and wife. Working side by side with her husband, who has nearly 30 years experience as a jewelry creator on his own, Claire’s pieces lean toward the rustic, blacksmith feel that has dominated the jewelry design community in the last year and look like they could’ve been created inside a certain blacksmith’s shop long before it became a famous bar and tourist hangout. Blue lends her talent to this new and ever-changing gem of a gallery that features works by Gina Feschet, Barrett DeBusk’s Fat Happy sculpture collection, and my personal favorite, Stephanie Akers. 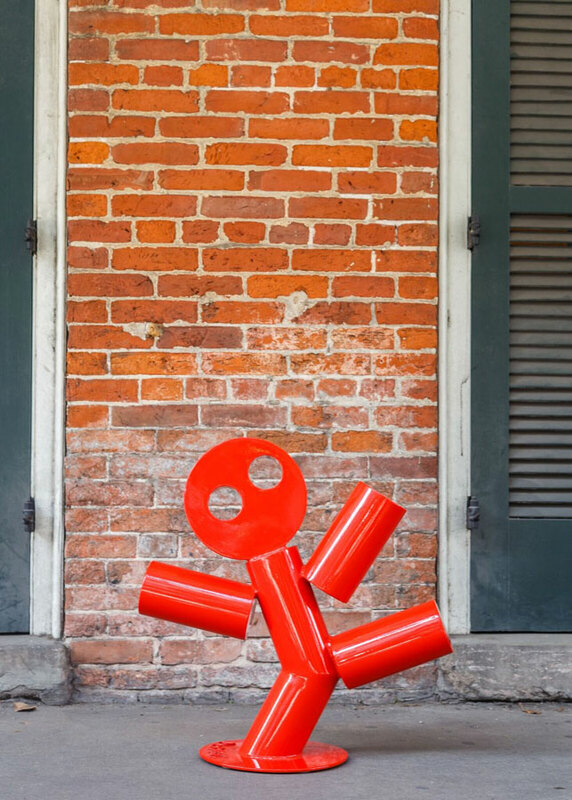 Something new has landed on Royal Street and promises to change its little corner of the French Quarter’s famed street. The Modernist Cuisine Gallery threw open its door in the 300 block of Royal Street late last year after gaining huge success and high praise for its gallery opening at the Forum Shoppes in Caesar’s palace in Las Vegas earlier in 2017. MCG is the first gallery to focus solely and entirely on the images of food by one artist. 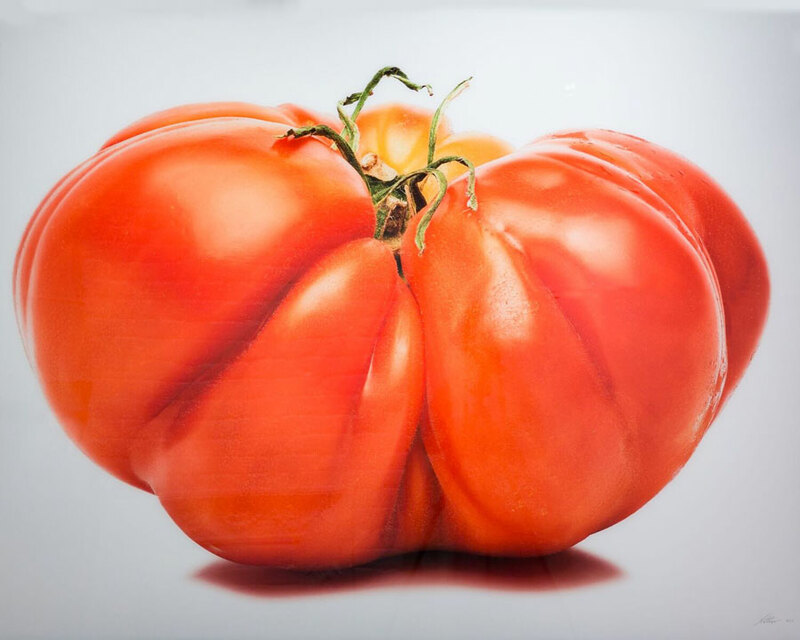 The gallery offers limited edition prints of Nathan Myhrvold’s photographic images of food in a variety of sizes, announcing that they have recently created the largest images they have ever produced. Food is an obsession that has spanned the globe. On social media, food photography is a close second to the selfie craze. As a society, our obsession with how we look is equaled only by what goes into our bodies. We want the world to see when we are eating healthy. We want the world to see when we indulge in something not so healthy. We especially want the world to see when we are consuming something from the “right” restaurant, in the “right” city, with the “right” somebody. We define ourselves with what we eat. My chocolate chip cookies sit in the back of the pantry while my protein bars have the starring role up front. I am proud of the tiny little section of me that is healthy. Having seen far less impressive introductions in the eighties and nineties, food photography books have come and gone with the wind, like the burning of Atlanta, and none of them has been nearly as remarkable as Nathan Myhrvold’s work. He has introduced us to a new way of seeing what we eat, while still maintaining that our food reinforces our cultural connections to the world. The images jump from the pages of books he co-authored, including Modernist Cuisine: The Art and Science of Cooking, The Photography of Modernist Cuisine, and his most recently, Modernist Bread. I have always said that taking something we see every day and changing the way we see it is the sign of a real artist, and the work in this gallery doesn’t disappoint. It’s impossible to mention Myhrvold and his work without commenting on his work with pizza. The Land of Pizza, a limited edition of 300, features pizza in the shape of Italy. Taking the Americanized version of an Italian dish and shaping it into the country of its origin is genius. I especially loved his additions of Sicily and Corsica. Underground Embrace, two carrots beautifully twisted into each other during growth, transports us to a subterranean place where we feel we are seeing these two embrace and dance. The movement is exquisite, and the color is unlike any other orange you’ve ever seen on a carrot. Jewel tones guide us down through the maze of connections the two have made and release us out through the tips of the roots into darkness, a journey I took more than once as I stared at this outstanding creation. But don’t think that Myhrvold’s genius only relates to food. Half and Half introduces us to a familiar silhouette in a whole, or not so whole, new way. A Kitchen Aid mixer has been bisected to reveal the workings of its inner components. But the artist doesn’t stop there: the attached bowl is bisected and filled with the whipping motion of … wait for it … the half and half we all should add to our chicory if we are proper New Orleanians. The glorification of movement in this image is undeniable as the half and half moves inside the bowl maintaining its form through motion. The limited edition is offered in a series of 300 and with all images, the gallery offers framing options to its patrons. Motion is something that we see a lot of in this gallery’s collection. Cut the Mustard has us relishing a far too often overlooked condiment (see what I did there?). Taking a backseat to its cousin mayonnaise no more, the beautiful, yellow liquid shoots across French fries like a Sports Illustrated swimsuit model flips her wet, blonde hair back while standing on a beach. 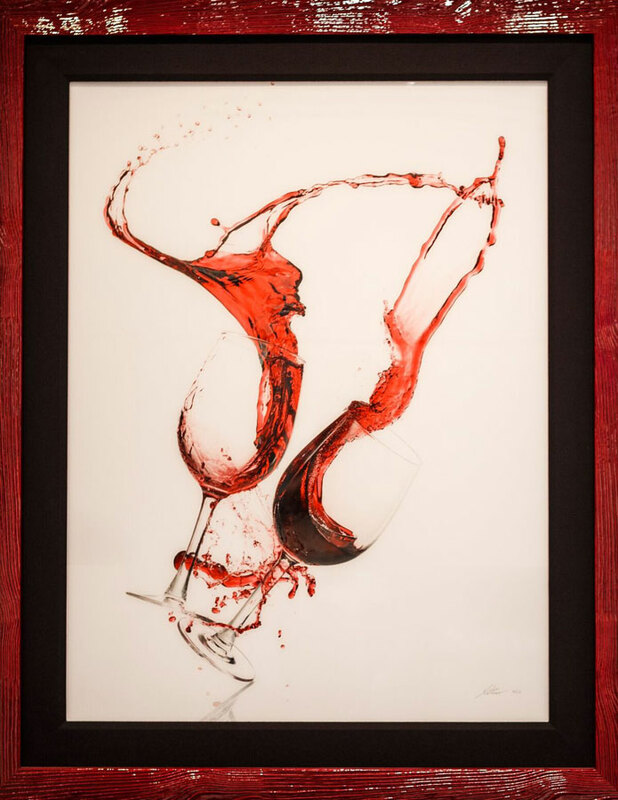 Intertwined advances movement as red wine sloshes from dancing glasses. The liquid’s forms perfectly echo the human torsos and arms lost in the emotions of dance. It’s been a long time since an artist and a gallery has struck a chord with me the way this one has. Color, texture, movement, ingenuity, and change--all the boxes are ticked here at this locale, the newest member of our Royal Street family. My journey to love change has not only led me to taking advice from real professionals, but has also helped me to understand that change means that something new is just around the corner. New can be good, new is good, change is growth, change is necessary. Say that over and over again, and you just might start to believe it.